Equipped with eneloop rechargeable lithium-ion battery technology, the Sanyo Pedal Juice provides stable, long-lasting 9-volt power for analog and digital effects and other electronic music gear. Compact and rugged, the unit offers up to 50 hours of power at a time, and can be fully recharged in around 3.5 hours using the included AC adaptor. It’s also extremely quiet, as its design eliminates noise and hum that can sometimes occur when pedals are powered with external AC supplies. The X-Series takes advantage of the latest BOSS tech to provide superior performance that adapts to any playing style or register. The OD-1X Overdrive and DS-1X Distortion pedals offer highly natural sound, great response, and wide tonal range. Designed specifically for bass, the BB-1X Bass Driver delivers bold, punchy sounds, exceptional versatility, and pro connectivity. 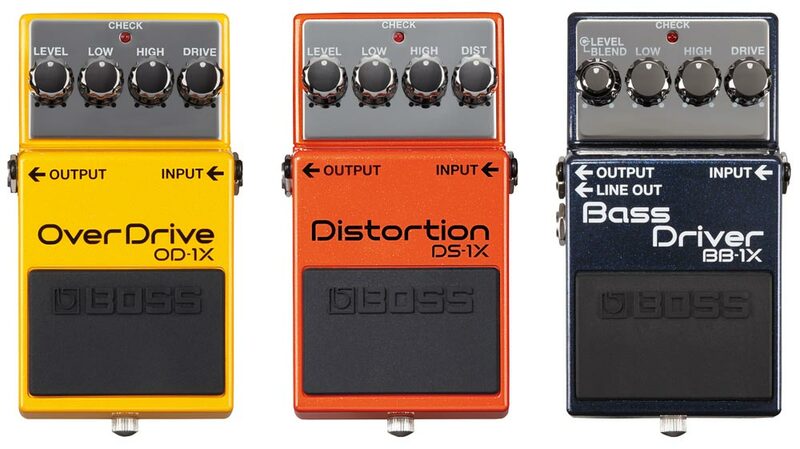 BOSS X-Series: OD-1X Overdrive, DS-1X Distortion, and BB-1X Bass Driver. Built with all-analog components, the Waza Craft series offers the ultimate BOSS tone with modern enhancements.­ The BD-2W Blues Driver, the SD-1W Super Overdrive, and DM-2W Delay all deliver signature BOSS sound from the past and present, plus switchable modes that provide customized tone options for all-new sounds.